Karina’s Nora & Giveaway & Fun Fashion Friday Link Up! I found the absolute most perfect summer dress. The Nora by Karina Dresses is fun, flirty, and even has pockets! I love this cobalt blue with classic white dots. Isn’t it fun with red shoes and white bag? I’m ready for a July 4th party! Or a date! Or the office! Karina dresses are wonderful for traveling too. They always look fresh and wrinkle-free! The Nora is a knee-length fit and flare dress with pockets. It has flattering shoulder pleats with cap sleeves. The Nora is V-neck with a wrap-look front that never shows too much. And a pretty Karina dress always makes me wanna twirl! Ready for the very best news? Karina has agreed to hold a giveaway just for my readers and one lucky gal will win the Karina dress of her choice! Enter through the rafflecopter widget below. Enter your email address to get on Karina’s mailing list and be the first to know about new styles, prints, and sales. And get extra entries for following Karina and Fashion Should Be Fun on social media. I feel it’s only fair to warn you though: once you have one Karina dress, you’ll want more and more! 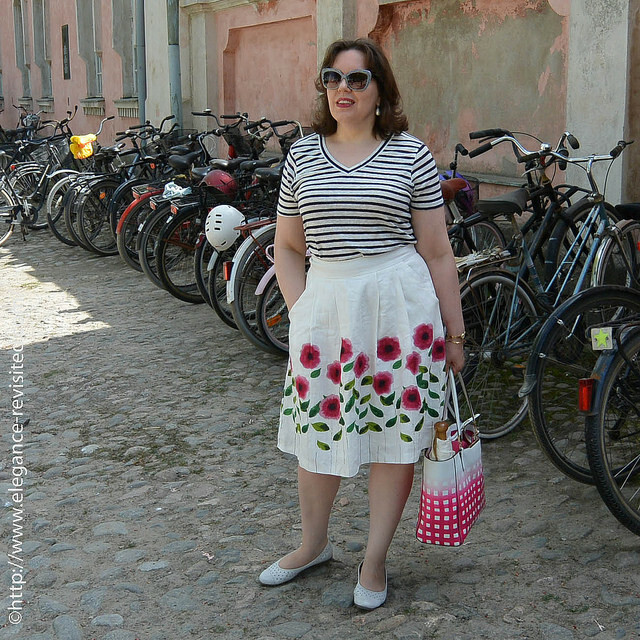 Tiina at Elegance Revisited is mixing prints like a champ. 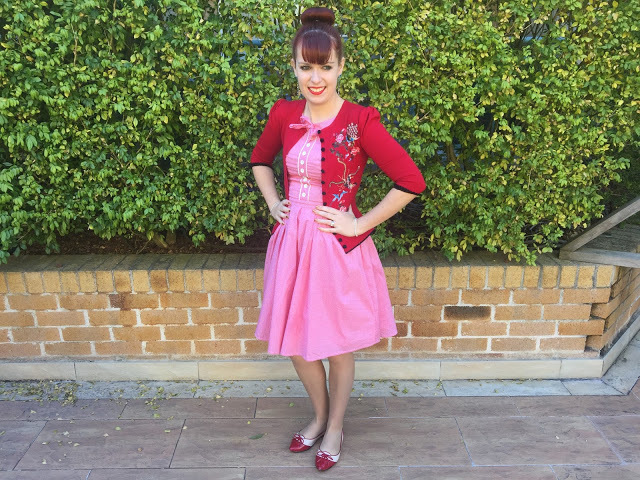 Samantha of Fake Fabulous looks lovely in this pretty color combo. And Imogen of Tia-Cherie looks like a little doll is this sweet look. Okay, Gals … link up, link back, and have fun! You look fabulous! I love the cut of the dress, and how great that it's wrinkle free! Your accessories are awesome, too! I love the red heels & the bag! Your are indeed ready for anything! OH sweet, dear lady, how you shine in blue. Blondes look spectacular in Blue, but there is something extra special about this ensemble…YOU!!!! And that twirl…..so frickin' Fabulous!!! Hugs for an awesome weekend love!! Pretty dress and it looks fanatastic on you too. I need to check Karina out. Such a gorgeous dress! I love that it has pockets, the best! Well I can totally see why you love this dress—it's absolutely a dream on you! I have yet to try out the Karina's dresses—shame on me!! Maybe I'll win one and then get addicted!! Thanks for both the giveaway and hosting!! Thank you so much for featuring me! What a lovely surprise! And a dress with pockets, brilliant! You can never have too many of those, especially in such a pretty shade of blue. Have a wonderful weekend! 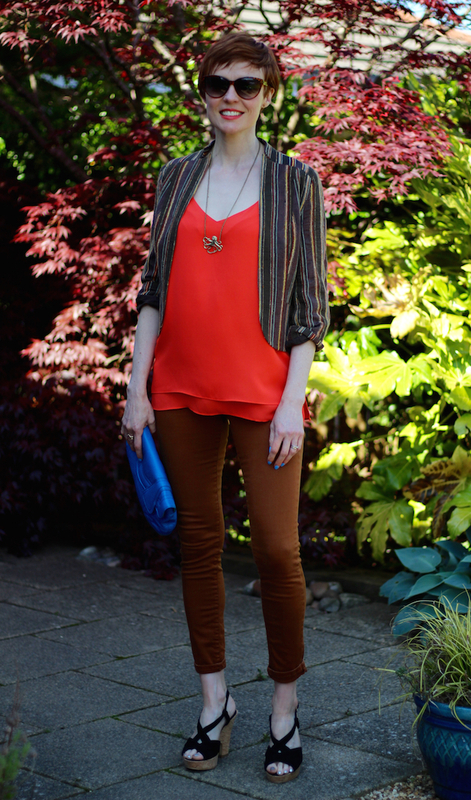 Loved this pattern mixing outfit of your, Tiina! so FAB!! The dress is such a gorgeous colour on you! Your dress is gorgeous! I love the unique heel on your shoes too. Everything looks fabulous together! Thanks for hosting! I love this sleek spotty dress. It looks like the kind of versatile dress we could all do with. Thanks for the linkup party! So, so jealous of this dress! You may send it to me at the first opportunity. Beautiful and perfect styling. It would look fab on you, Emma! 🙂 Seriously they are my favorite dresses ever! Right? I hate spending the time and money getting things dry cleaned! Thanks, Celia! This dress is so cute & looks amazing on you! Have a great weekend Dawn Lucy! Dawn Lucy, this was my reaction to your beautiful polka dot Karina dress…"oh. Oh. OH!" It is just gorgeous! I want one! Such a super cute post Dawn – that dress looks absolutely amazing on you! Love the retro vibe of the dress! This is your color! You are stunning! Cute polka dot dress, playful and fun indeed! Thank you for hosting the linkup! You look amazing, Dawn Lucy! 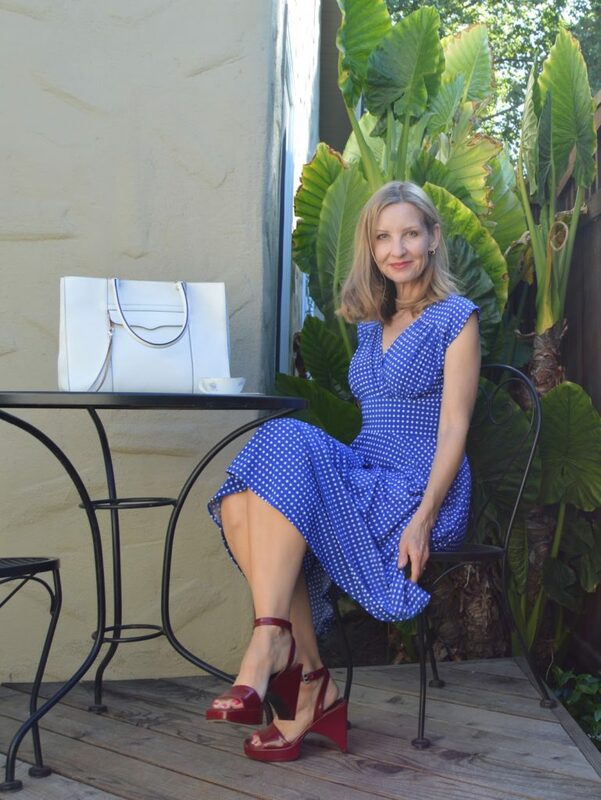 The bright cobalt dress is gorgeous! I love the silhouette and the fun red shoes! Really pretty! Beautiful dress! Love the color. You look gorgeous!! Very pretty choice. The color is so romantic. That is a cute dress and those sandals look good with your dress! I'm a sucker for dresses with pockets! You look fabulous! Thank you for the linkup and giveaway! Love this Karina dress on you! That color are fit are gorgeous! That dress is so very flattering on you Dawn! And I have to say I'm loving those sandals. Thanks so much, Debbie! These are my vintage Pradas … thrift store steal!! What a great dress…looks like it was made for you Dawn! Thanks for the link up…have a great weekend. That dress is just darling! Love the cute print! That is a cute dress! Love the vintage flair! This dress is spot on! Great look on you and that empire cut is so flattering. I am in love with the Nora dress on you and in general. I have a couple and the pockets and color are great.I will take a few Karina dresses on vacation as they are easy! You look AHmazing! Love the shoes you paired with the dress. That beautiful dress, I love the pattern and design. A gorgeous look. I love this classic look of blue and white polka dots, so beautiful. Thank you so much for featuring me as a favourite from last week, such an amazing surprise! The cut of the dress is a classic, early 1940s style, popular on the dance floors of the day (not your desire to twirl), and almost universally flattering on curves. I started link up too, would love it if you join and link up. That silhouette with the wide waistband and crossover bodice has always been a favorite of mine and the pockets are a great bonus. And wow, you look fabulous in the shade of blue. Thank you for adding your post to my Up, Down, All-Around link-up. This is the perfect dress on you – the cut, the color, everything! Absolutely beautiful! Hope you have a wonderful weekend! Aren't you cute as can be in this dress? The color, fit… everything is just so YOU! This has got to be one of my favorite dresses I've seen you wear, LOVE!!! Those shoes really complete the look, too. Aww thanks so much, Carrie! Hope you entered the giveaway! I adore the print of that dress, it's so perfect for summer! Such a gorgeous dress! I love the print and it fits you perfectly! This dress is so chic! Love the polka dots! I absolutely love those shoes with the dress. Great styling, and you look amazing. I dont think I will able to stop dancing if i had on this trudy dress (http://www.karinadresses.com/products/trudy?ref=yotpo_94), i love the print. Oh my goodness that dress, to die for, super cute! I love that picture of you twirling, such a kid at heart, I love it. Adorable styles! I am inspired by these looks. I want this blue dress for me. Thanks a lot for sharing the wonderful article.